In addition to Mr. T’s regular Valentines Day present I picked him up a bag of Chocolate Covered potato Chips. I figured everyone needs something sweet on Valentines Day so why not try something different. 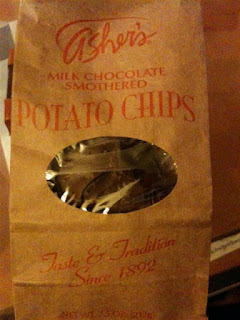 This is a bag of Asher's Chocolate Covered Chips that I picked up at Macy’s. I was pretty excited about the prospect of having salty, sweet and crunchy all together in one package. Unfortunately it didn’t quite live up to the expectations I had for these sweets going in. The chocolate itself was seriously rich and unfortunately it just too much for the perfect salty, sweet, crunchy combo I was looking for. I couldn’t really get a good salty chip taste. 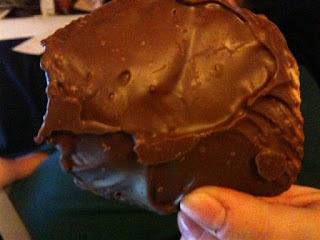 However the more I ate, the closer I got to the chocolate potato chip perfection I was looking for. 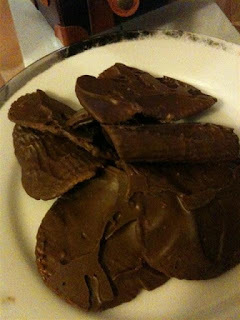 I realized that the curled chips had less chocolate and therefore more of the salty sweet balance. If only all of the chips could be curly it would really make these babies awesome! Oh well, it was a nice try for something different for Mr. T on his Valentines Day.